Here at First Christian Church, we believe that the Christian life is best lived out within community. Oftentimes Sunday mornings are hectic and a little overwhelming and not too much in-depth fellowship takes place. Our solution to this lack of in-depth fellowship are Life Groups. People need other people to worship with, to be encouraged by, and to be accountable to. People also need other people to help them live out the teachings of scripture, to serve with, and to live life with. Life Groups exist to fulfill people’s need and desire for real and authentic Christian community. Life Groups happen in home where real life usually happens. 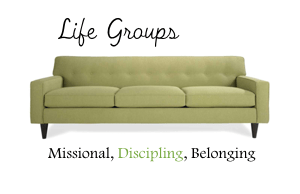 Life Groups are meant to be relaxed and restful, but also purposeful and intentional. Life Groups help people grow deeper in their relationship with God, their relationship with others, and their relationship with the community and world around them through acts of service. Life Groups will typically involve Bible study and discussion, prayer, service, fellowship time, and a meal. Our Life Groups are designed in a very unique and intentional way. Out of a four week month, two weeks will be dedicated to some form of in-depth Bible study, one week will be dedicated to some form of missional outreach to our community, and the last week will be spent meeting with another Life group from another age range. One of the goals of this slightly different approach is to provide a way of engaging our church community in monthly acts of service to our broader community. Christian are often accused of being a mouthpiece without being the hands and feet of Christ. We desire that our community is a community of disciples who make other disciples, who think purposefully of serving the poor and the broken, and who love their neighbor as themselves. Encouraging each Life Group to think and dream up acts of service to their community as part of the monthly rhythm of meeting together will help accomplish this purpose. Similarly, by meeting with other groups from other age-ranges it provides a way for people to truly get to know other people from the church outside their age group. Too many times churches are divided into different age groups, who very rarely have opportunity to connect. This becomes a real loss to the community since the young need the wisdom of the old, and the old often need the excitement and exuberance of the young. So much is gained with different generations sit and learn from each other, especially within Christian community. Each group will have a specific day each week they will meet for their in-depth studies, but the service week and the combined group weeks may be a slightly different day and time the week it is scheduled for. Also, those who have children should not worry – Children of all ages are welcome! For groups that have several little children, babysitting arrangements will be worked out. Children are an integral part of our family and having them part of the formation process is something we very much desire. We desire their service with their parents, we desire their bible development, and we desire their mixing with different age groups within our bigger body. Life Groups for families with children is a family ministry not simply an adult bible study, so please join other families who are seeking community to raise their children God’s way. All of our groups will be launching Fall (October) 2013. The day and time of each group will be determined by the leader and host of each group based their availability and the group at large’s availability. As previously stated, Life Groups happen at people’s home because that’s where real life happens. Locations will be determined by the location of the Group leaders. If you are interested in being part of a Life Group please contact Pastor Kyle by email (kylewjones@gmail.com) or by phone 363-2532. There should also be a sign-up sheet at the Life Group table to sign if you are interested.